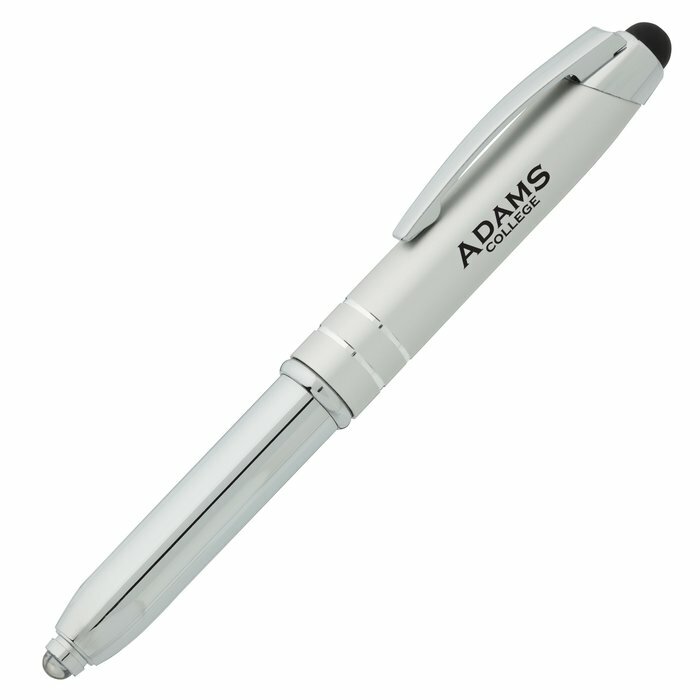 Illuminate your logo on a custom pen! This two-piece metal pen with its integrated stylus features a flashlight on the opposite end. Simply push the flashlight tip to turn the small white LED light on and off. The removable cap functions as a stylus for smudge-free touch screen use. Writes smoothly in black ink with a medium ballpoint. The chrome lower barrel and shiny accents give the pen a sophisticated appearance. A pocket clip allows you to keep the pen on you at all times. Flashlight runs on three replaceable button-cell batteries. Your price includes a one-color imprint on the cap.